position of the boss instead of you being the boss, this tutorial is for you. attempt by entering wrong unlock code; then this tutorial is for you. counter back to zero. Without much stories, let’s dive into business. 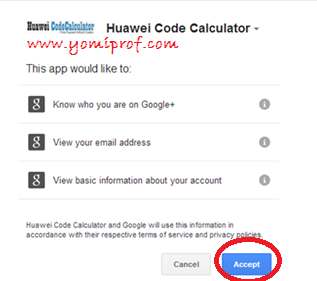 How Can I Reset My Huawei Unlock Code Back To Zero? modem in the given box and Click on generate. ===> Now it will ask to click on +1 Button to get your code. 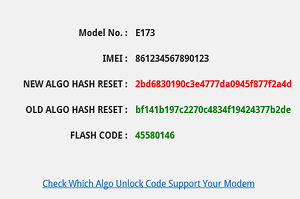 ===> You should now see the Result of New algo hash reset as well as Old algo hash reset Code. 4. Finally, your modem counter should now be set to zero; meaning you can regenerate new algo code to unlock your modem afresh. 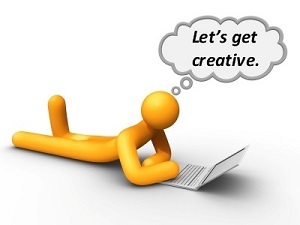 ThePaidTask is a new innovating job site, where you will be hired to do some task, different in type and number. 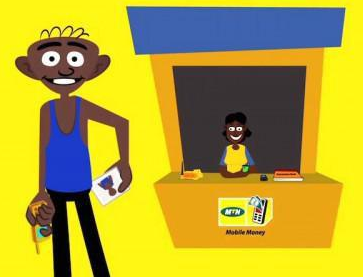 and you will be paid a estimated reward for that instant in your account, after it the job poster will review the service and approve the status for your payout, then you will be paid for your work via western union. Money gram is also coming soon. 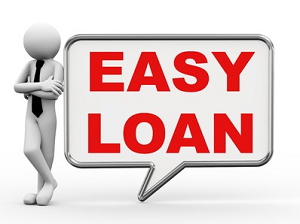 You have to create a account with us to start and login to your member area, and do daily your jobs and you will be really great after using our service. at Prof i got this error AT^CARDLOCK="ce59f91c2e461089153c6544b4a109d1"
+CME ERROR: 3 when i tried harsh resetting it though i have complained to Jigal and he was he is still working on the error. I had no option than to sell my glo bolt Huawei e303 and i bought glo bolt zte mf667 and just right at the glo office were i was registering the sim for the modem, i cracked it with dc-unlocker and the sweet thing about the higher version of glo bolt is that it downloads at 21.6 mbs compared to the e303 which downloads at 7.2mbs though its more expensive at 6k to e303 at 4k. Prof please, help me to unlock my modem. I have tried all I can and I haven't been able to. It's an e303 glo bolt modem and the imei number is 861195003008568. I will be really greatful. If u want to send it to my email, it's [email protected] but you can put it here if you wish. Thank you in advance. @Kingsley, thank God at least you got a glo modem that is unlockeable. I knew something like this will happen when Glo introduce that cheap 3k modem. That error message you are getting, should be from the hash reset calculator and i beleive it will be fix soonest. how do I downgrade it? Hmmmm Prof, let me try the downgrading method. Just hope i would not crash somebody's modem. 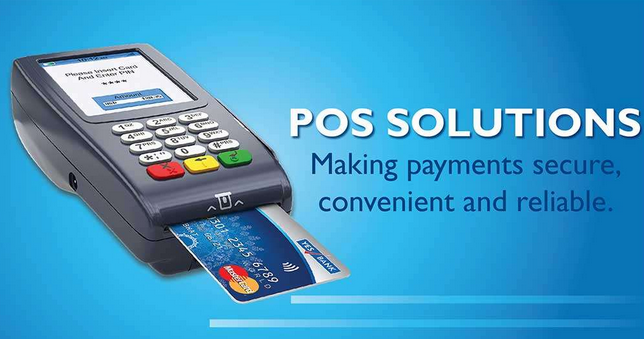 Please when such error is being fixed let us know o! Thanks. Prof Yomi, please send me the DC Unlocker 2 Unlimited. I haven't git it. Prof yomi, pls i need the DC Unlocker my e-mail is [email protected]. Thanks. I will sent you the DC unlocker client once i get back home latter today. I will wait, thanks again. @Mr bones, am not the one ooo. I have never demanded for money and I'll never demand for money on this site. I blog for fun and not for money. My Name is Yomi and will never seize to be Yomi. Check your mail please, the DC unlocker has been sent. prof pl i need the steps on downgrading the glo modem too. do i need to drop my email? Request you to help me with fixing the same..
hello Jay, please stay calm i'm trying to fix this +CME Error, as soon as it is fixed, you will get my update. Tnx for understanding. 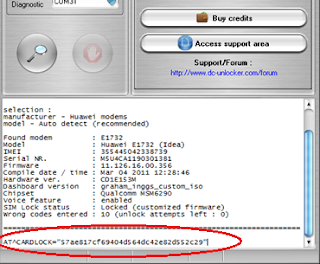 If this dc unlocker didn't work in your Huawei modem, You can try to unlock it using unlock code. 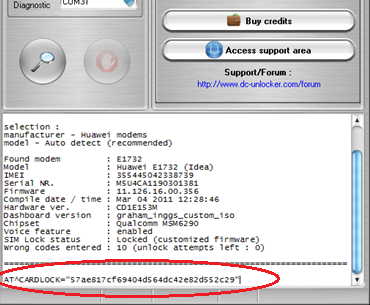 You can get the unlock code for a Huawei modem from Unlocking4U.Com at affordable cost with free unlocking guide. Good luck. PLEASED …WOULD YOU HELP ME WITH DC UNLOCK UNLIMITED…[email protected]…… SEND TO ME…. THANKS ….. I'm Sourav From West Bengal, India. I'm a Home User, I'hv a Huawei E303D Idea Netsetter modem, I tried every single process, I read every type of post and used many software to unlock my modem. But every time I failed to unlock. 1. I Upgrade its Dashboard from "Idea Net Setter" to "Mobile Partner". –Modem status: SIM in Modem not accepted. Locked.
! THIS SOFTWARE IS FREE AND IS NOT FO? SALE!!! It shows "Device Status Unknown"
give me any other solution, i'm very tired. Please help me. I am really tired at my age of 76 years.Please give a reply to my email address. I could not able to reset the counter using the steps given in this page. I'm getting the below error message. Could you please help me? Any solution to the +CME ERROR: 3 yet? 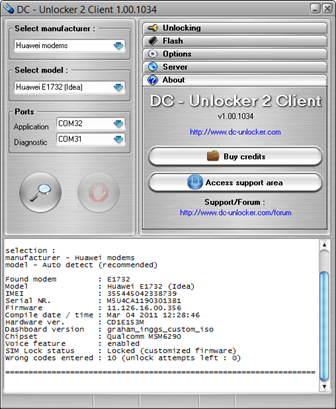 Hi,Prof,kindly send me the unlimited dc unlocker so that i can use it for my k3772 modem.Thanks in advance.